Not to say that our newest employee didn’t take good care of them. They were cleaned and cared for. But a new Madame Alexander doll came in, and it was misidentified as a…well, Liz is telling me I need to let it go, and I guess she’s right! 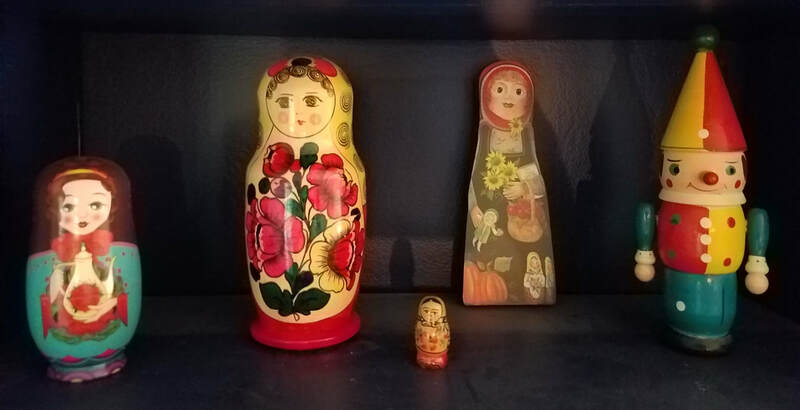 But I thought today that I’d talk a little about matryoshka dolls, otherwise known as Russian nesting dolls. We get them in from time to time, and sell a fair share. It might be one of our most asked for items from non-serious collectors. That’s not to mean there aren’t serious collectors. (Oh, bother. There’s that baby brain acting up again.) I just meant that because of their decorative nature, we get more casual buyers: people who don’t own any or collect any other type of vintage toy, but think a set might look nice on their entertainment center or on top of the piano. Usually they don’t want to pay too much and quite often we can accommodate them. But the value of a set of matryoshka dolls varies widely. As always, age and condition matter, of course. And subject matter. (We had a set of clown matryoshkas that sat on the shelf forever, since clowns, frankly, aren’t as universally beloved as they once were! But political and sports matryoshkas will almost always find an audience, as will the more traditional woman in peasant garb.) The number of dolls in the set will make a difference, as will the quality of the paint and the vibrancy of the colors. Also signatures. We always look for signatures of the artist. And if it’s by one of a handful of famous Russians? Cha-ching. Of course, not everyone is a fan. 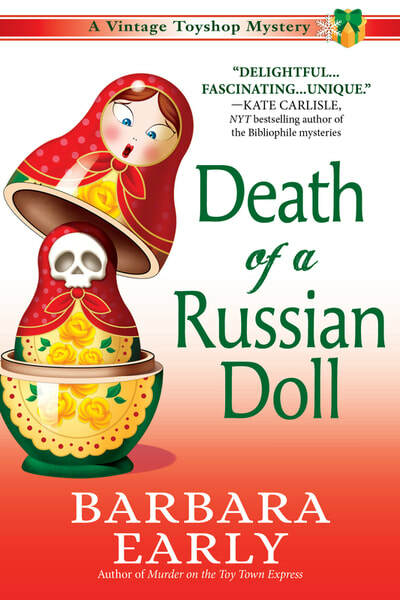 Russian dolls involve two things that Liz isn’t very fond of right now: dolls and Russians. Not since a certain Russian woman came to town with claims on a certain dashing police chief. I think Liz has even been turning our Russian doll around so she doesn’t have to look at it—but she denies it. Do you, or have you ever owned a set of Russian dolls? Contest will end on Saturday August 4th, roughly at noon. I'll be at the Suffolk Mystery Festival then, but will choose a winner as soon as I get back! And if you're in the Suffolk, VA area--or could be--be sure to check it out and come and say, Hi! I have a collection of them and some are not the traditional. Mine are probably not collectible. They are dogs, cats, Harry Potter and some pollitics. Someone in my family had a set of the Russian dolls and they also collected nutcrackers...sounds fascinating. My older girls had them when we lived in Germany. Thank you for the giveaway. I’ve never had a set but I think either my aunt or grandmother did. I have not owned any. Would make an interesting collection, though. mcastor07 (at) gmail (dot) com. I don't have any russian dolls. I have wanted to read this series. I had a little set of nesting dolls when I was a child. I have a set of Russian nesting dolls - a gift from a friend when she returned from her trip to Russia. I have seen Russian Dolls, but I don't have any. I don't have any Russian dolls, but I sure think they are cute. Never have nor wanted to have Russian dolls. I love reading about them. Thank you for the giveaway! I own a couple of them and a kid story book about them. One set actually came from Russia, picked up for me by a friend. They remind me of when I was a kid visiting my grandmother who had one. We were always taking it apart and putting it together. We would even make up stories about them. Looking forward to this book. Thanks so much for a chance in this giveaway. My sister brought me some Russian dolls back from Russia, but somewhere among our many moves they got lost. I think they are fascinating but I've never had a set. I have never had them but my friend does and she laughs as i am at her house every Wed and i admire them everytime I am there. peggy clayton ptclayton2@aol.com would love to read a print copy and review on a few sites!